Today is the 7th anniversary of the release of the text of Summorum Pontificum! Deo Gratias! 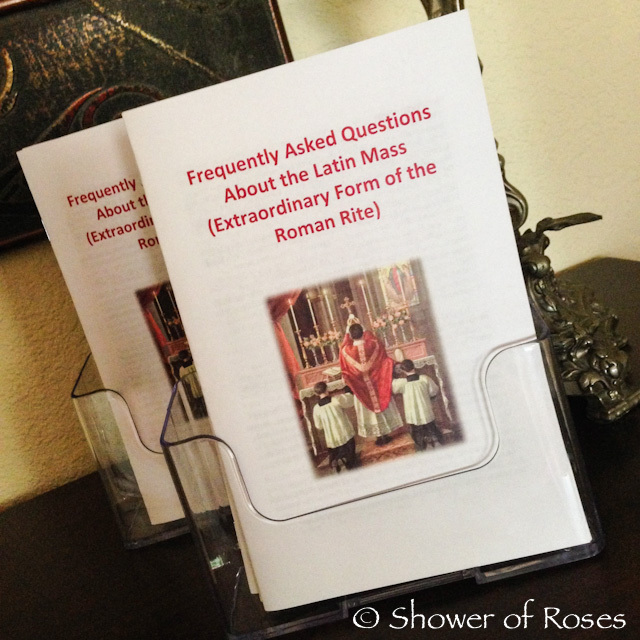 Earlier this year I mentioned that my husband had created a Frequently Asked Questions pamphlet to hand out at our local Latin Mass, which we are so grateful to now have once every two months. (We attended our July Latin Mass yesterday afternoon and our next Latin Mass will fall on September 14th, the anniversary of the implementation of Summorum Pontificum!) Some of my visitors have asked if I could post the pamphlet here at Shower of Roses. In honor of today's anniversary I finally have it to share with you all! In this pamphlet my husband quotes from a number of sources including The New Roman Missal, The Latin Mass Explained, Know Your Mass (excellent children's book), The Story of the Mass, The Heart of the Mass, My Imitation of Christ, For the Visitor at Mass, and My Catholic Faith. Download pdf to print a copy for personal use here. Note: You are welcome to print copies to share with family and friends. The Second Vatican Council declared that “The liturgy is the summit toward which the activity of the Church is directed; at the same time it is the font from which all her power flows.” (Constitution on the Sacred Liturgy, Sacrosanctum Concilium (SC), No.10,Vatican II). The Latin Mass was celebrated by priests worldwide after the Council, including the stigmatist Padre Pio until his death (1). The Catechism of the Catholic Church (CCC) states that: "The mystery of Christ is so unfathomably rich that it cannot be exhausted by its expression in any single liturgical tradition." (CCC, #1201). Many Catholics in the modern world, find it spiritually beneficial to recover contact with their heritage of worship and to strengthen their Catholic identity. As the Catechism of the Catholic Church succinctly says, "the liturgy itself generates cultures and shapes them." (CCC, #1207). How should a newcomer prepare for the Latin Mass? A Roman Catholic priest answered this question this way: ‘for the first few times, we shouldn’t try to follow along or read. We should prepare and participate in a way similar to how we would for adoration of the Blessed Sacrament – quiet prayer and meditation, while enjoying the beauty of the Mass without distracting ourselves by trying to follow a text. That could be left for later. The older form of the Mass, he explained, is actually easier for people at any level, any state of mind or at any place spiritually. Basically, it’s easier for everyone. Those who want to follow along can do so and get a good deal out of it. Those who are not ready to follow along can still “participate” in the way most suitable for them. How should a regular participant discern the Mass? Every Catholic should know some basic fundamentals surrounding the Mass. Foremost, the Mass is a renewal of Christ’s sacrifice on Calvary where Our Lord first offered Himself to the Eternal Father (7). The Mass is a New Law fulfillment of the sacrifices from the Hebrew priests in the Old Law. From the very beginning of the world and God’s covenant with man, man has acknowledged God’s existence and supremacy and given Him gratitude for His gifts by offering sacrifice. Bishop Morrow defines sacrifice as “the offering of a victim by a priest to God alone, and the destruction of it in some way, to acknowledge that He is the Creator and Lord of all things” (8). Sacrifice is done to adore God, show our gratitude, ask for his care over us, and atone for our sins against Him. Why is the Mass in Latin if I don’t understand it? Saint John XXIII in this document also stated that the Church “values especially the Greek and Latin languages in which wisdom itself is cloaked, as it were, in a vesture of gold.” The Holy Spirit chose three languages in which to proclaim Christ as King when no one else would. On the day of His Crucifixion Hebrew, Greek, and Latin were the languages that proclaimed, “Jesus Christ, King of the Jews” on the inscription over the Cross (John 19:19-20). All three of these languages are used in the Extraordinary Form of the Mass. Moreover, the mass is more of an action than a prayer (2). What is more important is to know what the priest and us are doing - and the people join the priest more in action than in word (2). Thomas à Kempis in his book My Imitation of Christ advises us the proper manner to approach the altar: “Christ: so neither can it please Me whatever you give, as long as you offer not yourself. Offer yourself to Me, and give your whole self for God and your offering will be accepted.” In the Old Law, the people sometimes could not see what the Hebrew priest was doing, much less hear anything being said, yet they joined in the action of the priest with his own prayers, each for his own needs (2). Similarly, the people who assist at Mass unite with the priest in the one Great Act of offering the Most High the saving Victim, like Mary, St. John, and Mary Magdalene at the foot of the cross (2): “If, therefore, you desire to be My disciple, offer up yourself to Me with all your affections”(6). Why does the priest have his back to me during much of the Mass? Traditionally, churches were constructed to face east, towards the Heavenly Jerusalem. The entire community shares the same heavenly destination, demonstrated by this orientation. 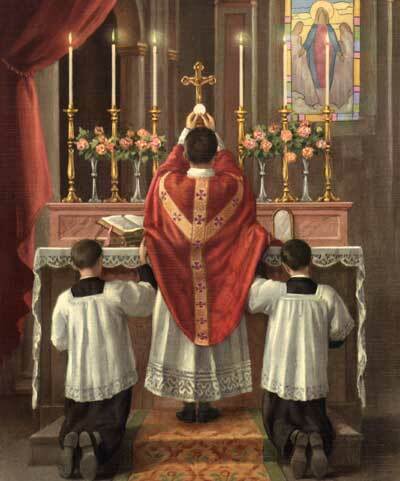 The direction of the priest and congregation facing “ad orientem” (Latin for "to the east") signifies that the Mass is our collective offering to God through the channel of the priest. This question can also be answered by three questions: Who is the most important person in the church building? Who are we here at Mass for? Whose day is Sunday? The answers to these questions show that the focus must be on God. During the Mass, the priest faces the most important Person in the building at church, Whom we are at Mass for, and Whose day it is; God, leading us in prayer to Him, as the pilot of an airplane leads those entrusted to him on his aircraft (and a pilot also has his back to those under his care). Similarly, the priest is the spiritual head of the community. He offers sacrifice to God during Mass on our behalf. Taking bread and wine provided by the community, the priest offers to God the sacrificial Lamb with the objective of giving God our adoration, our plea to Him to continue looking after us, atonement for sins, and thanksgiving. The priest functions as our spiritual leader during the Holy Sacrifice of the Mass leading us in this mutually shared objective which can be likened to combat officers who exhibit their rank or insignias on the backs of their helmet so their unit can easily find and follow their leader to the assigned objective. Why are there so many silent parts in the mass? A Roman Catholic priest answered this question the following way: The General Instruction of the Roman Missal (GIRM) explains that the purpose of silence “depends on the time it occurs in each part of the celebration. Thus within the Act of Penitence and again after the invitation to pray, all recollect themselves; but at the conclusion of a reading or the homily, all meditate briefly on what they have heard; then after Communion, they praise and pray to God in their hearts.” Moreover, the instruction reminds us that we need silence “so that all may dispose themselves to carry out the sacred action in a devout and fitting manner.” Silence serves for our own benefit; it elevates our interior recollection to increase our personal devotion and grow in closer union with our Divine Lord. Here we have the wisdom of the Church, as the Holy Spirit leads us to eschew all human priorities outside of God and to draw our hearts to the reality of this sacred encounter. The Mass finds its ultimate purpose in the condescension of God to meet with us and nourish us — and for us to respond in a manner worthy of this gift of all gifts. It stands to reason that our behavior at Mass will be proportionally devout to the degree we believe this meeting of heaven and earth is actually happening. Why is the Canon of the Mass, the Consecration, whispered by the priest instead of spoken aloud for us all to hear? In the wanderings of Israel through the desert, whenever the tabernacle had to be moved to another location, God commanded Moses to veil the holiest things of the sanctuary (Numbers 4:5-12), because holy things are veiled in mystery. Israel foreshadowed the Catholic Church (1 Corinthians 10:6) and the tabernacle foreshadowed the Catholic churches. So holy were the vessels of the sanctuary that God told Moses, “Let not others by any curiosity see the things that are in the sanctuary before they be wrapped up. Otherwise they shall die.” (Numbers 4:20). The holiest part of the Mass is the Canon, and the Consecration, and out of reverence for its sacredness, much of the Canon is veiled in the reverent silence of a whisper. Why is the book transferred back and forth from the altar? It is customary that churches be erected in such a manner that the priest faces the East (ad oreintem) when offering mass, in the direction of the Heavenly Jerusalem(1)(2). The North had come to be regarded as the foreign land of the Gentiles. When the “Gospel of the Kingdom” was first preached and rejected by the Jews, it was then carried to the Gentiles(1). This is signified by carrying the Missal to the other side of the altar and turned so that the priest now faces North for the Gospel reading instead of East. This action is done to glorify God in the successful delivery of the Gospel taking its first roots among the Gentiles. (1) Kieron Wood. 1991. The Most Beautiful Thing This Side of Heaven. Newsroom, RTE, Donnybrook, Dublin 4, Ireland. (2) Msgr. George J. Moorman. 2007. The Latin Mass Explained. TAN Books and Publishers, Inc., Charlotte, NC. (5) The Heart of the Mass: Explanations from various sources of the prayers, ceremonies, and mysteries of the Holy Sacrifice, and the benefits of devout participation (compiled from approved sources). 2003.Legend Publications, April 2003. (6) Thomasà Kempis. My Imitation of Christ. 1954. Confraternity of the Precious Blood. (7) Fr. Richard Gider. 2008. For the Visitor at Mass. Angelus Press, Kansas City, MS.
(8) Most Reverend Lois LaRavoire Morrow, S.T.D. Bishop of Krishnagar. My Catholic Faith. 1994. Sangre de Cristo Products, Inc.
Introduction: The mass is divided into 2 parts: The Mass of the Catechumens and The Mass of the Faithful. The Mass of the Catechumens is considered The Mass of Preparation (3). The first half starts with us talking to God in prayer for reparation (Prayers at the Foot of the Altar to the Kyrie), in adoration and thanksgiving (Gloria), and for petition (Collects). The second half of the Mass of the Catechumens involves God talking to us: Epistle (Apostles and Prophets instruct), Gospel (Christ instructs), and the Sermon/Creed (the Church instructs). The Mass of the Faithful proceeds from the Offertory to the Communion – it is considered The Mass of Fulfillment (3). Its purpose is to reoffer the sacrifice of the cross and to receive our Lord in Holy Communion. Holy water is used to remind us of our baptismal promises and the cleansing of our souls before entering the Great Mystery of the Mass. At the Easter Season, the verse is replaced with the Vidi Aquam. wanted to go before the altar of God. Fr. Paul Carr (FSSP) writes that “in the Old Testament, God required of the priests who ministered at His altar that their lives reflected His own holiness (Lev. 21:6).” Therefore, the Church, after David’s example, asks in this psalm to be freed from sin and temptation to piously offer the Sacrifice to the praise of the Divine Majesty (2). Kyrie: The first step of our conversation with God. This threefold prayer of reparation invokes the Blessed Trinity imploring mercy from the Father, Son, and Holy Spirit to forgive us our sins. This is the only part of the mass that is in Greek – one of the oldest languages in which mass has been offered. The Church has also retained in the liturgy the Hebrew expressions Amen, Alleluia, Sabaoth, and Hosanna (2). Confiteor: The priest first expresses sorrow for his own sins. The server, together with the people, then in turn tell God they too are sorry for their sins. Introit: Should be considered the real beginning of Mass, which is why the priest makes the sign of the cross at the first words – a rule to begin all solemn functions (2). The Introit sounds the keynote of the mass and constitutes the public preparation by the priest and the people for their collective part (1). In a High Mass, it is read by the priest and sung by the choir. It is the first variable part of the mass. These variable parts are referred to as “Propers” because they show the proper nature of the day’s particular feast and change with each feast. The Introit is often taken from part of the Psalms. Holy Spirit (from ‘together with the Holy Ghost’ to ‘Amen’). Dominus vobiscum: Each time the priest turns to the congregation to greet the people he wants to call their attention to a very special part of the mass. These greetings are found in Ruth 2:4, Luke 1:28, and 1 Cor. 16:23. The priest says this with hands parted towards the people welcoming us to the Sacrifice in a gesture of giving. Christ comes to us by means of His priest. With his open hands he is gently reminding us that he is imparting to us at Mass supernatural grace and everlasting life through Christ (4). Collect(s): Prayer(s) of petition originally gathered on behalf of the people asking God the Father for some favor again invoking the Trinity. The word “collect” signified a meeting of the faithful for prayer in the early days of Christianity and contain the sum and substance of all favors asked by the priest for himself and for the people (2). Epistle: “Letter.” Instructions from the Apostles and Prophets and fit to the occasion of the particular day or Feast, they remind us of the life and teachings of Christ. Gradual, Alleluia, Tract, and Sequence: Short prayers following the Epistle to herald the Good News of the Gospel. The Gradual offers a short meditation on the Epistle. In the early days it was sung from the altar step (gradus being Latin for step and in our own use gradual meaning step by step) (4). The Alleluia is a Hebrew expression that means ‘praise ye the Lord’ and replaced by the Tract during Lent (1). The Tract is a longer less joyful prayer that takes the place of the Alleluia during sad or penitential times. The Sequence, a long poem, is added on certain feasts. Gospel: Chosen from Matthew, Mark, Luke, or John, these readings change with the feast. The priest and people make the sign of the cross asking God for the grace to know and love His teachings with our minds, profess it on our lips, and follow it with all our heart. Credo: The Creed is a public and solemn profession of the Faith (1) and expresses the chief truths a Catholic must believe. It prepares us for the Mass of the Faithful acting like a bridge or password into the great mystery of the mass. This prayer too is divided into what we believe concerning the Blessed Trinity: Father, Son, and Holy Spirit, then ending with the doctrines of the Church: Baptism, Resurrection, Eternal Life. The priest and people kneel at the words ‘Et incarnates est . . .’ to reverence the mystery of the incarnation adoring God made man (2). Offertory and Secret: From these prayers we prepare for the Great Sacrifice by preparing the offerings, confessing our unworthiness, and asking for help. Here we go to God. Father Lasance points out that when the priest pours water and wine into the chalice it signifies the union of Christ with all Christians especially those assisting at Mass: “the priest petitions the heavenly Father to unite our poor human nature so closely with the divinity of Jesus that nothing may ever be able to separate it. And even as these few drops of water lose themselves in the wine, so may also we lose ourselves in the divinity of Christ” (1). At the Offertory the priest prays to God to purify him: for humility and contrition, for blessing purification upon our offerings, and washing his hands as a symbol of purity. Washing one’s hands is an ancient symbol for purifying one’s soul. We likewise ask God to cleanse our minds and hearts of everything that would take us away from Christ: the priest says, “Pray brethren, that my Sacrifice and yours may be acceptable to God the Father Almighty.” During the Secret, the priest speaks inaudibly acting as our mediator, speaking directly to God on our behalf (1). The Canon: Sacrificial part of the mass, it immediately precedes the Sanctus. Father Lasance explains here that after the priest gives thanks to Almighty God for all His blessings, following the example of our blessed Lord at the Last Supper, the priest then, “alone and silently, enters upon the rite proper to the offering up of the unbloody sacrifice of the New Testament” and does this giving “utterance to the feelings of our great High Priest, Jesus Christ . . . and by the spirit of humility, love and adoration, which pervade these confident appeals to the omnipotent God” (1). It is also likened to the high priest in the Old Law who “entered alone into the Holy of holies. Like Moses, he spoke alone with God, and the Lord answered him . . . the priest’s voice no longer alternates in prayer with that of the people, for he alone is ordained to offer the sacrifice in the name of the Church, he alone can come into close contact with his Lord and his God. Silence envelopes, like a mysterious veil, the ‘enclosed garden’, the ‘sealed source’ of the divine mysteries” (1). The holy offerings are blessed three times by the priest while being called gifts, having come from God, such as Abraham’s loving regard for his son; presents, that we give back to God like Abel’s sacrifice; and holy unspotted sacrifices, “having been set apart from every profane use and which are destined to become the body of the immaculate Lamb” (1), such as Our Blessed Lord offered to the Almighty on Mount Calvary. The Consecration: The priest, in the Person of Christ, reenacts the scene in the upper room, with his beloved disciples gathered around him, “takes bread into his hands, raises his eyes to heaven, and blesses the bread” (1), changing the bread’s substance into Christ’s Body and the wine’s substance into Christ’s Blood. These separate actions are a symbol of His Death, when His human Body and Blood were separated (4). “The Elevation of the Consecrated Host and Chalice is a reminder of the Saviour raised on the Cross” (1). Prayers After the Consecration: The priest makes the sign of the cross 5 times over the host and chalice. Father Lasance explains that “the signs of the cross before the Consecration really bless the bread and wine and prepare them for transubstantiation; after the Consecration they are to be considered as commemorations – they are in memory of Christ’s passion . . . to the five wounds of Our Lord” [emphases added] (1). A prayer then follows asking God to receive our Sacrifice as He received the sacrifices in the Old Law, namely those of Abel, Abraham, and Melchisedech for the following reasons (4): God rejected Cain’s sacrifice because Cain did not offer himself with it while Abel did. Abraham and Melchisedech’s sacrifices both foreshadowed that of Christ, former subjecting his own will to God and latter offering a sacrifice of thanks. The faithful there present “who communicate with the priest during Mass” are then commemorated “for they are in the strict sense, offerers with him of the Holy Sacrifice” followed by an appeal for the Church Suffering in Purgatory “A place of refreshment, for they are in suffering; A place of light, for, as yet, deprived of God’s vision, they are in darkness; A place of peace, because they are enduring the purging flames” (1). Nobis quoque peccatoribus: “To us sinners”. These words spoken aloud by the priest, while striking his breast, break the silence as he cries to the Lord from the depths of his heart, calling upon those present to unite their plea with his (5). The Minor Elevation: At the minor elevation the priest ends the prayer ‘Through Him, and with Him’ . . . with the words in an elevated tone ‘World without end’ (‘Per omnia saecula saeculorum’) to signify the end of the prayer invoking the choir to respond “’Amen’ as “proof that the faithful in heart and mind with he priest in the act of sacrifice and prayer” (1). This also marks the end of the Canon. The Consecrated Host is broken in two in remembrance of the same ceremonial actions performed at the Last Supper. From one of the halves, the priest breaks a small piece in a gesture called the Fractio Panis – the custom for the Jews in Christ’s day where the head of the household broke the large flat cake bread into smaller portions at table as a sign of the unity of those around the table and father’s love for them (4). The priest’s gesture likewise is a reminder to us that Christ, breaking the break, blessing it and giving it to His disciples telling them to eat, is inviting us to eat, as members of His household, the Bread of Life (4). Taking the small piece of Host, the priest makes the sign of the cross three times over the chalice and drops it in to dissolve with the wine as a dramatic reminder that although Christ’s blood was separated from His Body on the cross, His Body and Blood were reunited on Easter Sunday when Christ rose gloriously from the dead, victorious over the tomb (3)(4). Just as food becomes part of us when we eat it, so we become united with Jesus when we receive Him in Holy Communion (3). 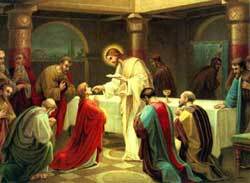 The norm for receiving Holy Communion in the Extraordinary Form of the Mass is kneeling and on the tongue. The ‘Domine non sum dignus’ (O lord, I am not worthy, etc.) are “words full of faith and humility” that recall the contrite and humble heart of the centurion admired by Christ (1). The faithful do not respond Amen, but rather contemplate, with humble acceptance and inward devotion, the Divine Creator of the World coming to them with all His Majesty and all His Humanity as the heavenly food for the healing of our souls for eternity. Ite, missa est: ‘Go, it is the dismissal.’ Or, in masses where the Gloria is omitted, these words are replaced with ‘Benediamus Domino’ (‘Let us bless the Lord’). Before departing, the Church desires to impart some last minute instructions. We are first told to “go now and live the Mass”, repeating the words of Christ before His Ascension: to preach the Gospel (4). Then we are imparted with a final blessing of the Church that God may give us the strength to fulfill our duty. Finally, the Last Gospel is read to remind us of the instructions we received in The Mass of the Catechumens (the first half of the Mass). That if we are going to bring Jesus to the world, then we must remember the instructions received by Him (3). (1) Rev. F.X. Lasance. 1993. The New Roman Missal. Christian Book Club of America. Palmdale, CA. 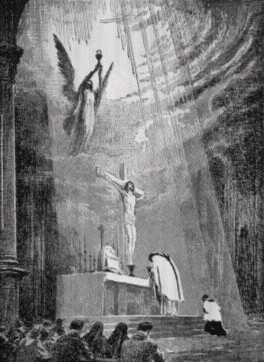 (4) The Heart of the Mass: Explanations from various sources of the prayers, ceremonies, and mysteries of the Holy Sacrifice, and the benefits of devout participation (compiled from approved sources). 2003.Legend Publications, April 2003. (5) Thomas à Kempis. My Imitation of Christ. 1954. Confraternity of the Precious Blood. (6) Fr. Richard Gider. 2008. For the Visitor at Mass. Angelus Press, Kansas City, MS.
(7) Most Reverend Lois LaRavoire Morrow, S.T.D. Bishop of Krishnagar. My Catholic Faith. 1994. Sangre de Cristo Products, Inc.